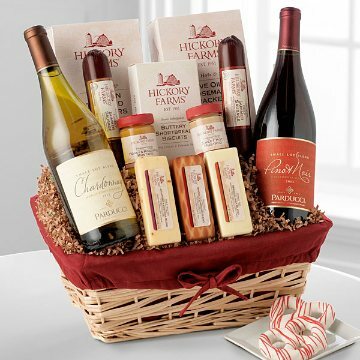 The most divine elements make up this gift: Hickory Farms gourmet treats, plus a white and red wine. Everyone is sure to find something they'll love! Parducci Chardonnay: Bold, lively character with crisp flavors of apple, pear and tropical fruits; Parducci Pinot Noir: medium-bodied, showcasing aromas of juice raspberries and strawberries, with a hint of cedar on the finish. Pursuant to state laws in New York, gifts that contain both food and wine will be sent in two separate packages. This gift includes the following: Hickory Farms Signature Beef Summer Sausage, Brown Sugar and Honey Turkey Summer Sausage, Smoked Cheddar Blend, Jalapeno and Cheddar Blend, Mission Jack Blend, Shortbread Biscuits, Olive Oil and Rosemary Crackers, Golden Toasted Crackers, Honey and Pineapple Mustard, Sweet Hot Mustard, Holiday Pretzels.